CEI Researcher Zach Zuckerman discusses mangrove conservation in Abaco! Flats Research Manager Zach Zuckerman was invited to perform an ecological assessment of Sand Banks Creek near Treasure Cay, Abaco. Together with Olivia Patterson of Friends of the Environment, representatives from Abaco Defenders, and with the support of Save the Bays, Zuckerman performed a visual census of habitat types and species present in the creek, providing preliminary data to emphasize the need for sound management of Abaco’s nearshore environment. 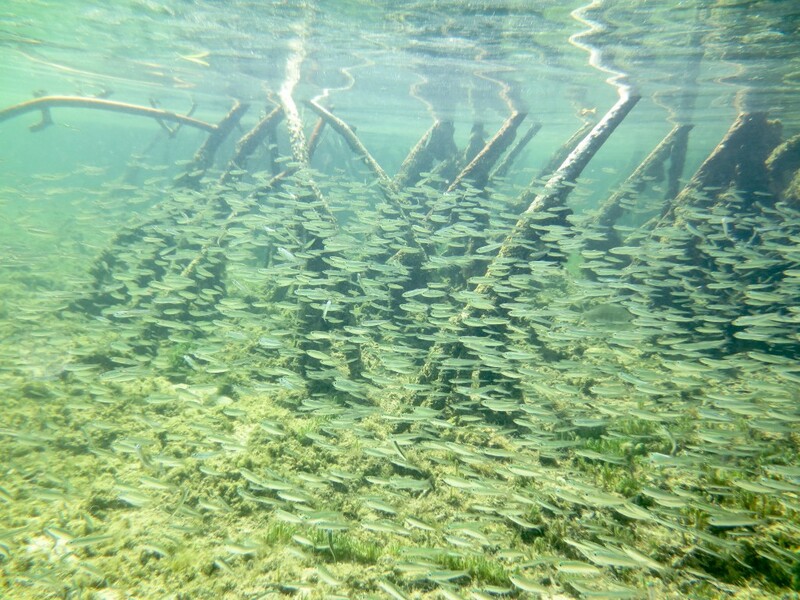 Mangrove roots provide structure, for protection and foraging, for baitfish and predatory fish alike. Two green turtles scoot by a snorkeler. 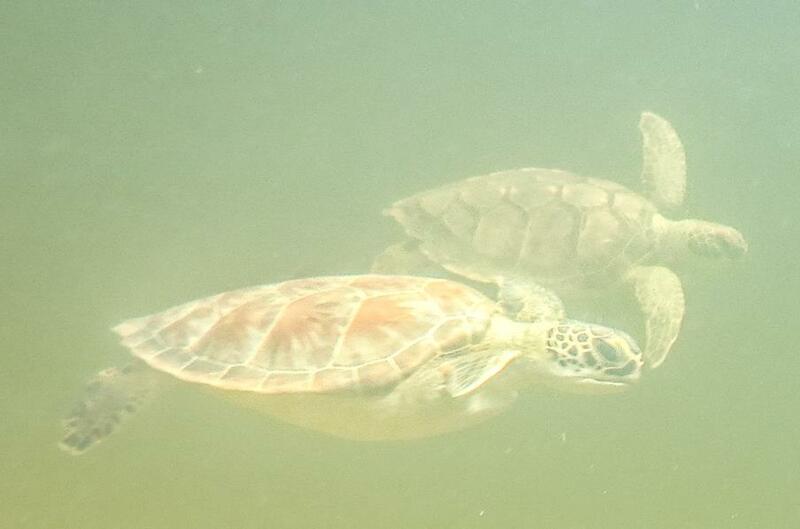 Hawksbill and loggerhead turtles were also observed in the creek. Land use change is a continuing threat to The Bahamas’ mangrove and tidal creek ecosystems; due to their proximity to the sea, beach and low-lying mangrove forest are particularly appealing for coastal development and construction of marinas. However, historical data on the ecology of already developed areas is often lacking, and communities are becoming increasingly involved in the protection and management of sensitive marine habitats. Such is the case at Sand Banks Creek, where historical, recent, and proposed development has altered a critical habitat, thus providing a need to collect data to describe the current status of the system. 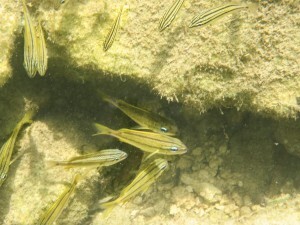 Juvenile bluestripe, white, and french grunts. Grunts are sometimes harvested for local consumption. Rapid ecological assessments (REAs) are a standardized sampling method to quantify the presence and abundance of species in a habitat, the habitat types present in a location, and to identify anthropogenic stressors on a system. Zuckerman and his team first assessed past and ongoing coastal development near the creek via satellite and aerial imagery, then surveyed the perimeter via car and kayak. The team also performed underwater surveys as part of the REA to identify benthic cover and aquatic species not observable by kayak. Findings: Sand Banks Creek exhibited signs of being a healthy and robust creek system. Primary habitat types include red mangrove stands, calcium carbonate rock ledges along the shoreline, laurentia algae (critical habitat for small Nassau grouper), and dense turtle grass flats. Of particular importance is the number of turtles observed (75+ including green, hawksbill, and loggerhead), many sub-adult lemon sharks, schools of bonefish both in deep and shallow water, and lobster ranging from only a few inches in length to full sized (and harvestable!) adults. Many sub-adult and adult mutton snapper were also counted, as were grunts, parrotfish, and Nassau grouper in the 8-10 in. length range. The presence of these species is of particular importance to the Bahamas. 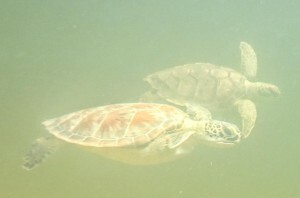 Sea turtles are protected and provide eco-tourism opportunities, and the presence of juvenile sharks, lobster, grouper, snapper and parrotfish suggest Sand Banks Creek is an important nursery ground for these economically important species, some of which are harvested for export and/or local consumption. Understanding the ecological role of mangroves, and the species that inhabit a location, can provide quantifiable data to support protection and management, and also identify areas which may be better suited for future development. Please check back for findings of ongoing REAs on Eleuthera and elsewhere!